Gas flex, packs, adapters, gas cowls. Vitreous enamel pipe, 1mm stainless flue pipe, clay pot adapters. 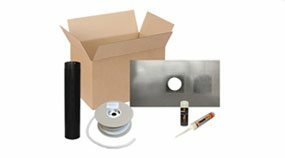 Cowls, terminals, flashings, register plates, flue boxes, installation materials. Flue Direct is a leading UK supplier of HETAS approved flue supplies, twin wall flue pipe, flexible flue liner and all other flue products for log burners, multi fuel stoves, wood burning stoves, fires, commercial and biomass boilers. 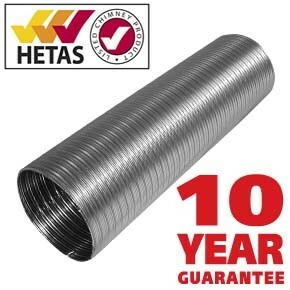 We offer free expert advice and design services on your flue system as well as the latest HETAS approved flue supplies, at very competitive prices for the trade and public. Orders placed before 1pm are processed the same day for delivery throughout the UK. Plus order over £150 and receive FREE delivery on UK mainland orders. 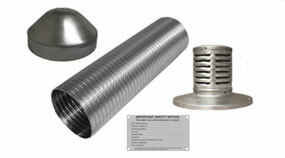 If you are installing a wood burner / stove into an existing chimney stack we have all the flue supplies you may need e.g. multi fuel flexible flue liner, chimney liner, vitreous enamel stove pipe. 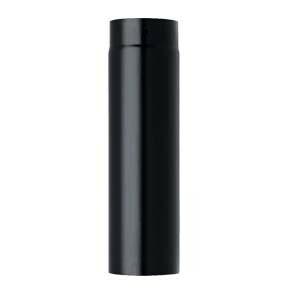 Or if you do not have a chimney stack you will need twin wall chimney flue pipe. 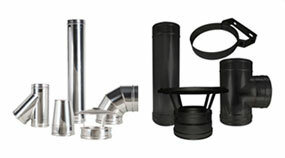 Flue pipe and liner available in all diameters, including the most popular 5 inch 125mm / 130mm and 6 inch 150mm. We have the widest range of flue diameter sizes in stock and on the internet, all at unbeatable prices: 3" 80mm, 4" 100mm, 5" 125mm / 130mm, 6" 150mm, 7" 180mm, 8" 200mm, 10" 250mm, 12" 300mm and 14" 350mm. We can also supply larger diameter twin wall flue such as 400mm, 450mm or 500mm diameter, please contact us for prices and stock availability. 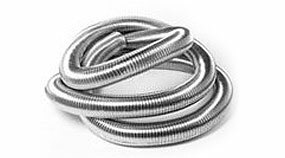 Flexible flue liner is available in both 316 grade stainless steel (10yr warranty) and 904 grade (25yr warranty). Both are suitable to reline your chimney for use with a multi fuel stoves and wood burners and are HETAS approved, for further information please refer to the flexible flue liner section. Our Twin wall flue is a simple push fit joint system (the easiest to fit on the market) and is available in both stainless steel finish or as black twin wall flue pipe in all sizes and is HETAS approved. 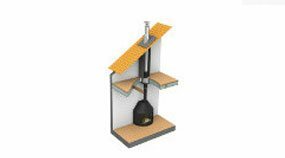 This can be used when you have no existing chimney stack and can pass through floors, roof or walls depending on your required flue route. The quality, manufacture and finish of twin wall flue pipe can vary significantly which is why we only supply premium quality chimney flue systems. We stock the Dinak twin wall chimney flue system as well as Convesa KC Flue pipe and are the UK's leading supplier of twin wall flue. Our business is built on our reputation, excellent delivery times, unbeatable prices and advice service. Please ensure that your goods have arrived before booking your installation service. If you have any queries please feel free to get in touch. Buy online or contact us on 01902 393 909 for more information on our flue liner, twin wall flue pipe and chimney flue supplies. Flue Direct Ltd have it all. How hot does twin wall flue get? What fuel is being burnt. Length of the flue (the base of the flue will be hotter than the top). What is a twin wall flue? 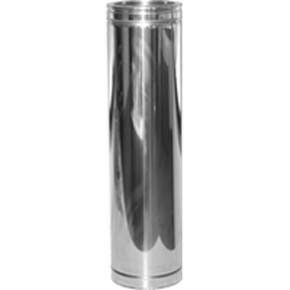 Twin wall flue is a double layered insulated stainless steel metal flue pipe that transports gases from wood burning or multi fuel stoves into the atmosphere. The system we offer features a simple push fit design for ease of installation. Why use twin wall flue pipe? In buildings where there is not already a chimney stack in place, installing twin wall flue allows you to have a stove in almost any room by creating a flue route to remove the gases from the wood burner to the outside. This can be out through the inside wall, then running up the outside of the building or up through the ceilings and out through the roof. Why do you need a twin wall flue? A twin wall flue is required when a chimney breast is not already present and cannot be installed. Creating a way to remove emissions from wood burning and multifuel stoves from the building safely. How much is twin wall flue? We work our hardest to find you a superior quality twin wall flue system for the best price. You can choose between stainless or black twin wall flue pipe. For an idea of part costs, take a look at our twin wall flue range. How to install twin wall flue pipe? Our twin wall flue systems are a simple push fit system secured by locking bands. For more information on installation, take a look at our Design & Fitting Advice. How to measure twin wall flue? A twin wall flue can never be smaller than the size of the stove outlet. Measure the diameter of the stove outlet and also check guidelines and restrictions on each type of stove with the manufacturer. The Twin Wall flue diameter is always based on the inside diameter of the flue pipe. N.B. The external diameter of twin wall flue will be larger due the insulation and the outer wall of the flue pipe and this will vary depending on the manufacturer. What diameter twin wall flue? HETAS regulations state that there is a minimum flue size of 150mm / 6 inch for any stove (on which wood could be burnt) unless it is Defra Exempt. Therefore, you may need to increase your flue size from your stove outlet using an increaser e.g 5 – 6 inches. Please talk to us for further information if required. What is the best twin wall flue system? 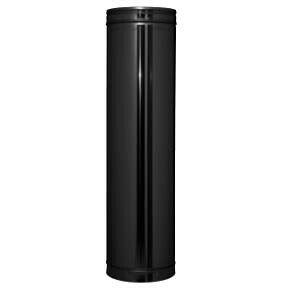 Flue Direct have searched high and low to find superior twin wall flue for our customers. Click here for the best twin wall flue system in both stainless steel or black. How to connect twin wall flue to stove? To connect twin wall flue to a stove of any fuel type, a connecting stove pipe can be used allowing more heat into the room through the use of a single wall flue such as vitreous enamel flue. Always allow for a vertical rise of 600mm immediately above the appliance before the system has a change in direction. Twin wall can also connect straight to the stove spigot if preferred or if distance to combustibles does not enable single wall flue to be used.